Borkum Riff Pipe Tobacco is created with a selective quality of bright aromatic Virginia burley tobaccos carefully blended together to give an exquisite taste and aroma. Available in a 12oz tin can, each Borkum Riff tobacco is infused with eight-year old Kentucky Bourbon combined together with the natural flavor of Virginia burley tobaccos bringing a distinctive aroma that is both traditional and discreetly masculine. Serious yet dynamic, once ignited in your favorite smoking pipe, Borkum Riff Pipe Tobacco offers a unique and captivating smoking experience of exquisite taste and aroma. 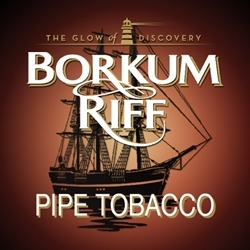 Borkum Riff Pipe Tobacco is distributed nationwide by Scandinavian Tobacco Group, Copenhagen, Denmark. Borkum Riff Pipe Tobacco is available at our online tobacco store in unique styles to choose from. Currently available in Bourbon Whiskey flavor. Here at Smokers Discounts we offer you a great way to relax and enjoy a great quality smoke at an inexpensive price. Borkum Riff Pipe Tobacco is an excellent choice for your pipe smoking needs. Our online tobacco store was created to make it easy and affordable to buy pipe tobacco online. Call us for more details!